We can’t have Mother’s Day without chocolate right? No we can’t! Today I have Truffles for you made with fresh Vermont cream, pure Belgian chocolate, sweet local butter, and all-natural flavors. It’s already melting in your mouth right? Would you like a picture? No preservatives, extenders, or additives. Only local Honey, maple syrup, and fresh cream from the area. Are you sold yet? Wait you haven’t tasted them! But I know you will believe me when I say Super Yum!!! The first thing I thought when I took my truffle out of the box is BIG. These truffles are my kind of chocolate! Usually I can pop a truffle in my mouth and eat it in a bite or two. Lake Champlain has truffles I can savor and enjoy. Sooooo creamy good. They are also elegantly displayed in their box so you won’t be disappointed to send as a gift. Even the individual truffle wrappers are a bit different and fun. Would you like to hear some of the flavors we sampled tonight? Ooh la la. oh, that isn’t a flavor. Just me thinking about these yummy flavors! Here are more that I haven’t gotten to yet. Are these flavors unique or what? Some are milk chocolate and some are dark. A great mix! Perfect for Mother’s Day or even just to have on hand. I can’t wait to share mine with a group of ladies I have coming over next week! And I just discovered you can find them at Whole Foods Market! YAY!! I received this product for review and all opinions are my own. This giveaway will end on May 9, 2013 at midnight EST. Winners will be drawn via rafflecopter. Once a winner is drawn I will contact them and they will have 48 hours to reply before I draw a new winner. Giveaway is open to anyone in US and you must be 18 years of age or older. Giveaway not affiliated with Facebook & I release them of liability. Winner will be posted in the rafflecopter widget. Yum Healthy Snack Bars! Giveaway with 2 Winners! Those looks delicious and I know my mom would love them for Mother's Day! 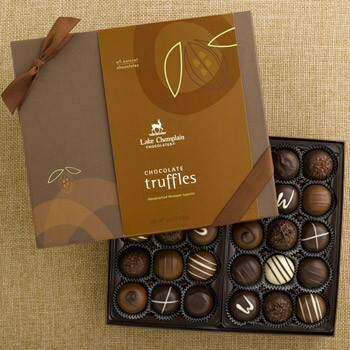 I love chocolate any day and truffles are my favorite...Yummy! I love truffles, they are my favorite! I would LOVE to win chocolates, eating them makes me happy! I love Chocolates for Mother's Day and every day! Love me some chocolates and these chocolates look so delicious! Yum, the chocolate treats look so good! Thanks for the giveaway. I visited the Lake Champlain Chocolates website and it all looks just Heavenly! I especially love the Almond Butter Crunch chocolates! And the Chocolate Caramels looks pretty good too! Thank you for the chance to WIN this YUMMY giveaway! Oh wow - that Champagne and Grande Valencia sound heavenly! That chocolate frog is really cute. I love chocolate every day of the year! and, if my family is as smart as I think they are, they'll give me some delicious chocolate for Mother's Day! I'd love to try the Maple Crunch from Lake Champlain. Thanks for the giveaway. I am betting these taste twice as good as they look. And they do look pretty awesome! I absolutely live for chocolate. My m,us have always! I would love the Dark Chocolate Sea Salt Caramels as I love dark chocolate (plus it is good for you) and I love the taste of salt with caramels. I'd like to win this for my wife. I DO love chocolate for Mother's day, although I seldom get any. I love to give chocolates as gifts to my Mom and Mother in law. Both enjoy a great tasting chocolate and is always pleased. There is nothing better for Mother's Day than chocolate. I love chocolate...who doesn't!? :-) Thank you. I just love getting chocolate for Mothers day! I love chocolate ANY day, not just Mother's Day! I would love chocolate for Mother's Day!! The chocolate caramels and almond butter crunch looks delicious!! i love chocolate everyday ,especially mothers day thanks for the giveaway ! I love chocolate! The NEW Temptations Trio looks delicious! 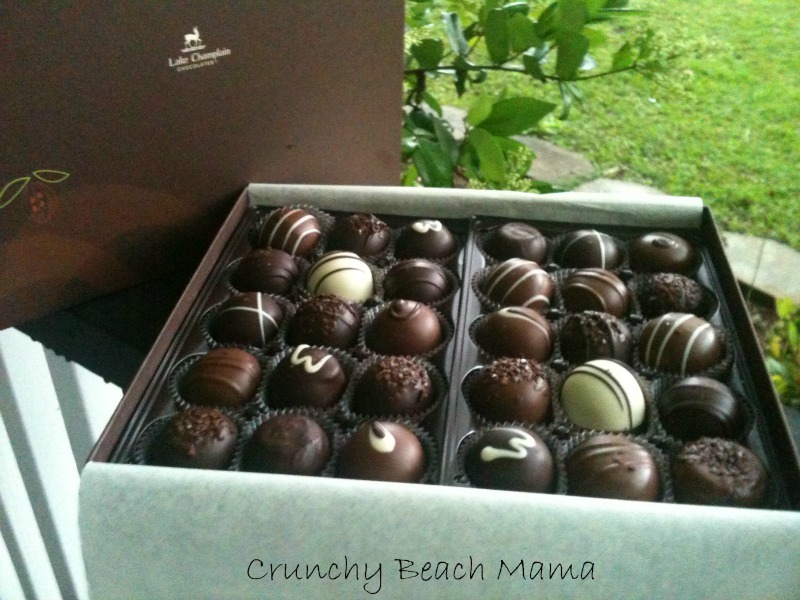 i am not a mother, but i love to give my mom chocolate anytime, especially for mothers day! I like their Mixed Bulk Chocolates Of Vermont 80pc! I love to give and get chocolate as gifts. I would love to try the Dark Chocolate Truffles! I LOVE LOVE LOVE chocolate!! Chocolate is good any day, right?! I also like it when the kids make special items at school for Mother's Day. Not to many things make me happier than a good piece of chocolate! i loooove chocolate for mother's day! Would love some good chocolate for Mother's Day. If I win, the prize is for mom on mother's day. Hope to win! Everything is so mouth watering but the NEW Temptations Trio sound amazing! Looking at these all I can say is Yummmmm. I am so in to chocolate, these look amazing! Lake Champlain Chocolates are sooooo gooooooood...yum...what mom wouldn't love them. Chocolates for my mother would be great. Just the other day she was hunting around her place for some chocolates. Would love to get some Chocolates for my granny! I love Lake Champlain chocolates. These chocolates look delicious! The Chocolate Fish are really cute Thanks! Could you tell my kids that I'd like the sea salted caramels for Mother's Day (if I don't win these truffles ;) )? The Chocolate Peanut Butter Cups and Milk Chocolate Sea Salt Caramels are making me drool! Hot chocolate mug and sampler looks like a great gift idea! It all looks great. Wouldn't Chocolate of the Month be a fantastic Mother's Day Gift??? This looks delicious!! Especially the Hazelnut Praline Flowers Chocolate.. yum! I love chocolate every day!! What a great assortment of flavors! Ok I just gained 10 pounds looking at all that chocolate! Sure would be nice to win it! You had me at praline! I love chocolate and so do the moms in my life - great giveaway! of course love chocolate on any occassion! especially dark chocolate! We have actually been to their store in Vermont to buy chocolates. I LOVE chocolate! The smoother and creamier and more milk chocolaty, the better. My mom and I both love chocolates, perfect for Mother's Day! These look so gorgeously yummy! I love chocolate! Good chocolate is always a special treat. I've heard about Lake Champlain Chocolates, but haven't tried them--yet. Love chocolate. I steal it from my kids when they go to school. They try to hide it from me. LOVE LOVE LOVE it! I absolutely love chocolate..all of them but dark is my favorite.Lake Champlain Chocolates look delish! I love chocolate. I have to hide it so when I need it it's still there. DYING TO TRY THE FLAVORS THAT YOU DESCRIBED! 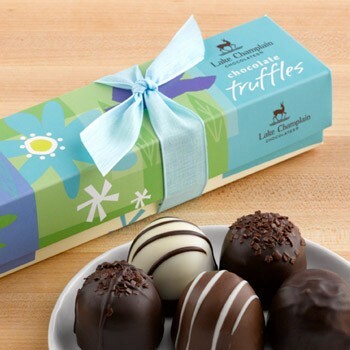 I love Lake Champlain chocolates...what a wonderful Mother's Day treat that would be! Who doesn't love chocolate?? These look and sound amazing...making my mouth water! Lake Champlain chocolates are my absolute favorites! What a fabulous giveaway! Thanks! Lake Champlain Chocolates are the best. Chocolates from Europe are great but given the choice, LCC's are always my first pick. Especially the Raspberry White Chocolate Truffles. Chocolate is one of the best parts of any holiday or celebration! Plus I think their Bebop Hop Chocolate Bar sounds delicious! I love chocolate any time. Chocolate is like a daily vitamin for me. Need some, even if a little, every day. Chocolate is delicious! Thank you for the giveaway! Chocolate- praline- caramel. I must be in heaven!! I LOVE truffles. They are, by far, my favorite way to eat chocolate. The NEW Fabulous Four set sounds amazing!! I love chocolate, great gift for Mother's Day. I love chocolate. It is my biggest weakness! I'd love chocolates for Mother's Day! I'd love the Chocolate Fanatics Club for Mother's Day! I love chocolate for Mother's Day, the truffle's look delicious! All i have to say is, YUM! the Mother’s Day Chocolate Gift Basket looks super yummy! Thank you! Who doesn't love Chocolate!? The Hazelnut truffle sounds yummy. Checked out their site, would like to also try the Assorted Sea Salt Caramels 15pc. Thank you for the sweet giveaway! I love chocolate any day! And sadly I am all out! Lake Champlain chocolates are sold in a lot of places up here so I know they are very good!!! Chocolate is delicious!! I do not consider a dessert to fulfill its purpose unless it contains chocolate. Gosh, a dark chocolate Caramel sound good right now! I would love to share these truffles with my mom! The almond butter crunch looks good! I love giving and receiving chocolates for all occasions. The Lake Champlain Chocolates look gorgeous and sound delicious! I'm addicted to chocolates would love to tr these they look delicious. Of course! Not only Mother's Day but every day! I love chocolate. These look so good! These look delicious! Truffles are my favorite! Of course I would love chocolates for Mothers Day. Mm, these look really good! I would love to try their dark chocolate covered orange peels! It sounds delicious! Ok my mouth is waterting now.. Lol they look delicious. Good luck everyone! Where I am now, it's 6:45 in the morning, and all I'm thinking about eating is chocolate! Oh my word! They all look delicious! especially the butter crunch. This looks like a supreme collection of truffles - truly delicious. It would be wonderful to have them. Sure, any day is fine, too! My upcoming birthday would be nice, too. These look amazing! I would love to have a subscription to the Chocolate of the Month Club! Thanks for the fabulous giveaway! we all love chocolate here! I would love to give my wife these great chocolates for Mother's Day. Chocolate makes my toes curl! I love chocolates any day!!! These look so delicious. No matter what they do to chocolate it always is good!!! These chocolates look amazing. I would love to try them. The chocolate look delish, especially the cute chocolate frog! Chocolate is a great gift to receive any day! I woulv loved to get the NEW Fabulous Four All Natural, Made in Vermont, Kosher, #FABFOUR Luxury Chocolate Gift Box A quartet of fine handmade chocolates that’s causing a sweet sensation! Everyone has a favorite, whether it's luscious sea salt caramels, smooth milk chocolate peanut butter cups, fruity-sweet chocolate-dipped orange peels, or decadent almond butter crunch (an American take on classic English toffee, covered in milk chocolate).